Maximize the appeal of every room in your home and take any interior design plan to the next level with our selection of stunning hardwood flooring in Prairieville, LA. Our well-established, locally owned flooring showroom is ready to be your source for design assistance and value-added home flooring. We offer a broad array of flooring products from some of the most trusted names in the flooring industry. Tell us more about the look you are trying to create, and we will identify the type of wood flooring that makes the most sense for your design plan. Our showroom is stocked with a variety of options, including solid, engineered, and handscraped wood floors. Take the first step toward achieving the flooring design of your dreams by coming to our location and browsing our collection of sleek and smooth surfaces. The flooring that we offer comes in numerous colors, shapes, and sizes. With so many options for grain patterns, finishes, and species to choose from, you may find the experience a bit overwhelming. That is why our flooring design professionals are here to help you find the right choice for your particular home. You tell us about the room in question and the décor you have, and we’ll provide you with a list of targeted options that match your needs. 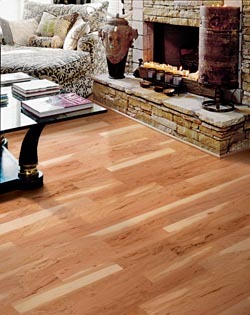 Wood flooring comes in either planks or strips, depending on the portion of the tree the product was milled from. Wider planks are more appropriate for rustic and vintage design plans. Our goal is to send you home with flooring that you are sure to love, so we are happy to spend time describing the different products we offer and answering your questions. It is important to consider the climate we live in when choosing a wood floor for each of the rooms you are decorating. Wood expands and contracts at different rates when exposed to humidity and moisture, so it helps to have a professional in your corner with the right knowledge and design experience. Whether you need to know the difference between engineered and solid wood or any other details about the flooring choices we offer, our team has the answers that you are looking for. Enjoy the look and feel of hardwood floors for many years to come by selecting our engineered wood planks for your new surface covering. This type of flooring is made out of multiple layers, giving it a durable strength that you can rely on. If you are looking to cover areas in your home that receive daily foot traffic or are exposed to moisture, engineered hardwood flooring may be the right choice for you. With our strong and sturdy material, you can rest assured knowing that your floors are prepared to withstand the wearing and tearing of everyday life. In addition to the increased level of moisture resistance that this variety of flooring provides, our engineered products are also a cost-effective alternative for decorators and homeowners alike. Dark wood floors display a sense of professionalism and formality while lighter wood floors bring in a sense of warmth and comfort. No matter what style you choose for your home, you are sure to be pleased with the results this flooring option provides. Enhance the aesthetics of your property and make any room stand out when you install our gorgeous engineered flooring planks. Set your home apart from the rest when you choose this elegant and charming option for wood flooring. Our solid hardwood planks are milled from boards of 100% hardwood that can be resurfaced up to ten additional times. This provides you with greater flexibility for any eventual redecorating you may plan in the future. These planks can be stained and finished in a variety of ways that give your home an earthy and traditional feel. This natural approach to home flooring is a great way to enhance the value and appeal of your entire home. Our design specialists can recommend a combination of solid and engineered planks that are suitable for each and every room in your home. A solid hardwood surface isn’t difficult to care for when you choose the right sealing option. Ask your design specialist about the maintenance needs of your particular flooring purchase, so you get the most value for the investment you are making. Solid planks make the most sense on the ground floor of any residence, and the resulting look is sure to leave guests impressed with your design choices. Your property serves as your personal retreat, and it deserves a custom design that matches your unique personality. Choose our handscraped hardwood for any room you are decorating with farmhouse furniture or comfortable leather couches. This variety of wood flooring is manufactured with a traditional process that woodworkers used to eliminate irregularities and shavings. Place flooring in your home that was made just for you by talented and hard-working professionals. The rugged style of this material helps to hide any scratches or dents that your floors may receive in the future. This makes handscraped wood a great option for any family with active kids and pets. It won’t prevent the scratching that is inevitable with kids, but it will make those marks much less evident. Get the best fit possible for your flooring investment, and avoid the buckling and damage that may come from substandard installation. Hardwood flooring installation requires exacting measurements and strategically placed expansion joints. Without these joints in place, you could find yourself paying for repairs before you know it. If the joints are too large, your flooring could come loose. Our experience makes a big difference in this regard, and you can save a great deal of time and money in the process. Contact us today for a broad selection of hardwood flooring options that can transform any room into a destination. We proudly serve customers in Prairieville, Baton Rouge, Galvez, White Castle, and Sunshine, Louisiana.